February 16, 2010 – Ashen and teary-eyed, Denver Nuggets head coach George Karl announces to the world and assembled media that he had throat and neck cancer. While the cancer was treatable, the aggressive chemotherapy used to treat the disease would prove to be nearly incapacitating for a coach who wanted to still be on the sidelines. To each side, several Nuggets players were gathered while Karl made his announcement. Among those assembled players was Carmelo Anthony, whom Karl just coached in the 2010 NBA All-Star game. Carmelo Anthony just had the worst statistical season of his career after being traded to the Oklahoma City Thunder from the New York Knicks shortly before last fall’s training camp. In reality, many of Melo’s complaints were accurate. This was a last-minute trade and the Thunder had to figure things out on the fly. Three star players on one team is the “formula” but only if their chemistry works. Russell Westbrook and the also newly acquired Paul George completed the triumvirate. It just didn’t work. 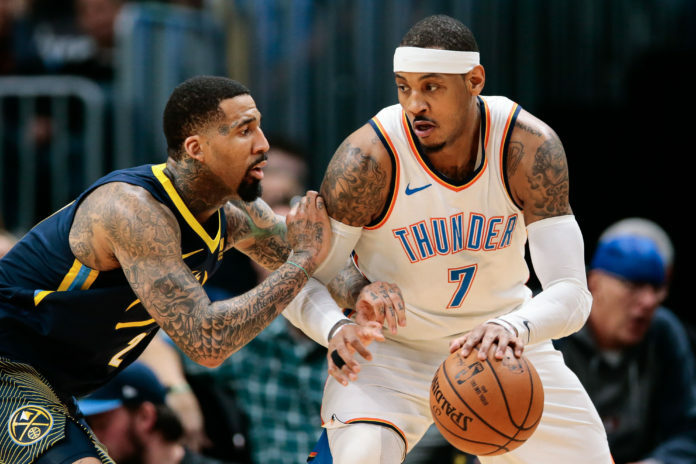 By the last game of of OKC’s six-game opening round series loss to the Utah Jazz, the Thunder were better with Melo on the bench. 15 seasons in the league and Carmelo Anthony was relegated to being the $27 million afterthought. Ever defiant, Carmelo proclaimed after the season that he sacrificed more than any player on the Thunder and, yes, moving him to the bench was out of the question. It wasn’t infuriating to see those comments from Melo from this Nuggets fan/observer — not at all — it was just sad. Was this the Carmelo Anthony who saved the Denver Nuggets from eight years of awful, playoff-less basketball in 2003? No, it wasn’t. One has to wonder what the perception of Melo the player would be or would have been if he stayed in Denver and accepted the contract extension the Nuggets were trying to get him to sign in the summer of 2010. In order to see why things happened the way they did, you must examine inextricably linked events that collided from 2009 to 2010 that forever altered Melo’s course in his basketball life. The Los Angeles Lakers and Denver Nuggets slugged out a six-game series in the 2009 Western Conference Finals. 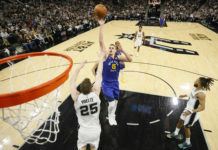 It should have gone seven games; hell, one could argue that the Nuggets should have won the series in four or five games were it not for two errant inbounds passes in games one and three. Aside from a game six blowout, the Nuggets and Lakers played a series that made you think those teams were going to go toe-to-toe for a long time. Evidently, the Lakers thought the same way, as from all indications they acquired Ron Artest in the offseason of 2009 to address their issues with guarding Carmelo Anthony. Kobe Bryant described guarding Melo as “wrestling a bear.” In fact, you can make an extremely convincing argument that games one and two in the 2009 WCF are maybe the best games Melo has ever played. Both offensively and defensively (with games three and four versus the Dallas Mavericks those same playoffs right on their heels). Those who were around at the time said Melo was genuinely excited about that Nuggets team. He had rededicated himself to the basketball lifestyle and came in to both the 2008-09 season and the following 2009-10 seasons in the best shape of his life. Some of that had do do with the trade acquiring city of Denver legend Chauncey Billups. However, much credit should be owed to Melo, who cut the cornrows, got in shape, and became a basketball monster. Even in 2008-09, when he scored less but defended better, took less shots and played the best team basketball of his career. At the beginning of the 2009 season Melo came in roaring. Playing at an MVP pace. There was no more clear evidence of “monster Melo” than the opening game of the season against the Utah Jazz and current Nuggets player Paul Millsap. Leading up to the 2010 All Star break, the Denver Nuggets had the second-best record in the league next to the Lakers at 35-18. The Nuggets were riding such a high that many pundits in the league were wondering if the Nuggets, not the Lakers were the best team in the NBA. Then came George Karl’s diagnosis. Anyone who knew George Karl and Carmelo Anthony was aware they didn’t exactly get along. This wasn’t quite Karl versus Ray Allen territory, but, within the same arena so to speak. The frostiness sometimes spilled over publicly. Who can forget Melo screaming at Karl on the bench, “Don’t just sit there! Do something!” as the Nuggets lost game three to the Lakers in 2008. They were eventually swept. Again in the 2008-09 season, Melo refused to be subbed out of the game for Linas Kleiza in a contest versus the Indiana Pacers. He was suspended for one game and even more cracks in the Karl/Anthony relationship were exposed. Many Nuggets observers wondered aloud if the coach and his star player were destined to have an ugly end, much like when Karl and sharpshooter Allen feuded almost violently with the Milwaukee Bucks. The addition of Billups three games into the 2008-09 season alleviated much of the mutual tension between Karl and Anthony. In fact, Billups’ mere presence and respect he had within player circles and indeed Denver itself helped stave off a toxic dynamic between player and coach and allowed the Nuggets to not only survive, but thrive. Karl coached through Chauncey and Melo felt a great deal of pressure come off his shoulders. It was no coincidence that this was the best single Nuggets season since 1985. The fact that the Nuggets were able to advance to the Western Conference Finals and push the Lakers as far as they did was a tribute to Karl, Melo and Chauncey together. However, there was still chill below the surface. Karl and Melo rarely interacted behind the scenes and the wall they built up to survive was about to be their undoing. Despite his relationship with Karl, in the offseason of 2009, Melo was excited about the future of the franchise. Multiple sources around Denver at the time indicated that Melo wondered why he didn’t have the same kind of influence over personnel as LeBron James, his superstar 2003 draftmate. Melo publicly lobbied for another big man to hopefully move Nene Hilario back to the power forward position in order to combat the Lakers twin towers of Pau Gasol and Andrew Bynum. However, the Nuggets started the next season on fire. Despite the tensions brewing underneath from Karl, Anthony, Kenyon Martin and J.R. Smith, the team looked as if they had not only maintained the level they ended the previous season with, they improved upon it. With the addition of Arron Afflalo and point guard Ty Lawson in the draft, the Nuggets were on the verge, it seemed, of something special. Then February 16, 2010 happened. Cancer, interim coach, and who the heck is running the team? George Karl managed to coach the Nuggets another 10 games after the 2010 All Star break before chemo made it impossible to coach. He left with the Nuggets holding a 42-21 record. When Karl finally left the sidelines, assistant coach Adrian Dantley took over indefinitely. The appointment of Dantley as interim coach was always a bit head-scratching as his role as an assistant coach wasn’t as prominent as John Welch or even Karl confidant Tim Grgurich. The Nuggets finished out the regular season with a disappointing 11-8 record, 12-12 in the games Dantley was coach. In the final 10 games, the Nuggets scoring average dipped dramatically as players stopped playing together and each possession became isolation Melo or isolation J.R. ball. Any semblance of the team basketball they were playing was through. No player listened to Dantley because it was clear from the outside that they didn’t respect him. So the Nuggets ended up tumbling from the second seed in the West to the fourth, tied with their division nemesis Utah. The overall vibe heading into that first round series with Utah was much different from the year previous. A heavy air hung over Pepsi Center as the team tried to pull itself back together after losing their head coach to cancer treatment and the increasing realization that they were not playing the same way they were before. The team lost to the Jazz in six games. It was a depressing and distressing end to what began as an amazing season. The offseason would go quiet for about two months while radio hosts speculated across the country about Melo maybe shifting his gaze toward the East Coast where he grew up. It’s not far off to say that there was a bit more than a little anxiety about what Melo would do as the offseason trudged on. Behind the scenes, Anthony had a huge decision to make. No one knew if George Karl would return to the bench. The Nuggets had spent the last two trade deadlines sitting on their hands. 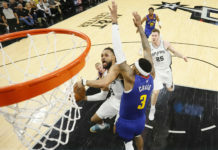 Erstwhile, Vice President of Basketball Operations Mark Warkentien famously said the Nuggets had “big bertha” in their bag in the form of a $10 million trade exception they got in return for trading Marcus Camby to the Los Angeles Clippers in 2008. It never went used. Melo wondered if they were serious about improving the team. It turned out to be a chaotic summer beyond just the Carmelo Anthony speculation. Warkentien and Rex Chapman — Warkentien’s fellow front office cohort — were nearing the end of their contracts with no attempt at renewal in sight. No one knew who would be running the team, including the players. It’s with this backdrop that the Nuggets offered Carmelo Anthony a 3-year, $65 million extension (the most they could give). Things calmed down a bit until Mark Kiszla dropped a bombshell in late June 2010. Kiszla reported that the Nuggets could trade Melo if he resisted signing the extension they offered in order to not have the same fate befall them that happened when they let Dikembe Mutombo walk away for nothing in 1996. From that moment until February of 2011, life was not the same for anyone. With a looming NBA Lockout on the horizon, decisions needed to be made. La La Vasquez was often seen at Pepsi Center. It helped, of course, that she was the wife of the Nuggets star Carmelo Anthony (she later took Carmelo’s last name and became La La Anthony). La La was deeply ingratiated in her dual role as wife of Melo and being an MTV personality who aspired to have a larger TV career. To say this didn’t contribute to Melo’s way of thinking would be foolish, yet, we will never know how much this ultimately led to Melo’s departure from Denver. There was so much going on, and it got increasingly complicated as the summer wore on. With a new extension sitting on the table for Melo, the Nuggets front office went through a gigantic makeover. Stan Kroenke began the process of handing over operational control of the Nuggets to his son Josh. Before that became official, the elder Kroenke let the contracts of Nuggets Vice Presidents Mark Warkentien and Rex Chapman lapse, ending the regime they managed since 2006. In late August 2010 the Nuggets hired former Nuggets European Scout Masai Ujiri. Six days later, Kroenke’s bid to take over the St. Louis Rams was approved and operational control of the Nuggets was handed over to Josh, who became the Nuggets (and Colorado Avalanche) Team President and Governor. One can only imagine Melo looking at all of this — coupled with the looming labor strife within the NBA — and wondering what the hell was going on. This was a misperception on Melo’s part if indeed he felt that way. Masai saw the expiring contracts of Kenyon Martin and J.R. Smith as elements the Nuggets needed to work around to remain competitive for the future. A mere seven months after his cancer diagnosis and extremely aggressive chemotherapy, George Karl was back on the Nuggets bench. Nearly miraculous considering the hell he went through to get the cancer addressed. When Karl returned, the future of the Nuggets as an organization was up in the air. What remained, however, was his poor relationship with his star player. The two men were never able to reconcile their differences and the walls they had built between them remained even after Karl’s return. Now, with it looking increasingly like Melo would leave, the Nuggets went into the 2010-11 season with rumor after rumor after rumor hanging over their heads. It all culminated in the Nuggets trading Carmelo to the New York Knicks on February 21, 2011. 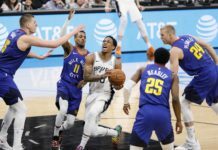 The first three months of the season had been in anguish as the Nuggets worked to extract the best deal they could possibly get from the Knicks. Their hope was, for all intents and purposes, that Denver set the standard for star player trades in doing so. The truth was, Melo decided before the season that he wanted to be traded to the New York Knicks. One can speculate about the factors in his reasoning for getting specifically to New York, but that is where he wanted to go. Remarkably, the Nuggets finished with a record of 50-32 that season; maybe the best coaching job George Karl had ever done in his career, all things considered. It’s hard to believe it has been nearly eight full years since Carmelo Anthony began the process that became known as the Melodrama. As someone who was covering the team through that entire process, it can be somewhat hard to describe to people just what it was like. I personally hope to never experience it again. I didn’t even go over the nightmare hellscape of false rumor after false rumor, including a famous one perpetuated by a local TV station. More than that, it’s complicated to discuss everything that happened in between the Nuggets trip to the Western Conference Finals in 2009 and Melo’s eventual trade in 2011. It’s not one thing. Many things happened that led to it, and one has to wonder what Melo’s legacy would be had he taken the three-year extension the Nuggets offered and remained in Denver. It is clear — despite their frosty relationship — what Melo and Karl had was better than what they could achieve apart. Karl’s cancer diagnosis changed everything. It changed the course of the Nuggets future, changed Carmelo’s way of thinking and changed the Denver public’s perception of what a superstar is. The Nuggets subsequent disappointing end to their once-promising season set forth a series of events that ended up with Melo being traded a year later. The Carmelo of the Denver Nuggets was not the Carmelo of the New York Knicks. Despite putting up gaudy scoring stats, there was no one there to challenge Melo in any sort of real way. The talent the Nuggets had around Melo was enough to make up for his weaknesses, at least for a time. Could Masai Ujiri have continued what Kiki Vandeweghe and Warkentien/Chapman/Bret Bearup did prior? Considering Ujiri’s significant track record since, it makes one believe that Melo missed out on a great opportunity. Alas, things changed. The Nuggets won 57 games in 2013, fired George Karl, Masai Ujiri left and have been going through a long rebuild since. Melo’s Knicks won 54 games in 2013 but didn’t make the playoffs his last four seasons there. When he was traded to Oklahoma City just before training camp, it was ostensibly because it was a place where he could contend. It didn’t happen. If Carmelo is to shape his future, he needs to get in shape like he did in the offseason of 2008-09 and rededicate himself to altering his game for the modern NBA. He’s talented enough to where he can do it. But, will that be in OKC or will it be elsewhere? That is the $28-million question. In reality, Melo never again achieved the success he had in Denver and the Nuggets didn’t achieve the success they had when he was here. In that sense, it’s proof the Nuggets and Melo needed each other more than they ever thought at the time. Melo’s legacy is therefore conflicted. Most fans can be left wondering what-if.